Justin Hatchett loves being on the farm. Hatchett was operating a tractor at his family’s farm on Mackville-Springfield Highway around 9 a.m. June 18 when it suddenly overturned. Justin was reportedly penned under the machine for nearly 30 minutes while rescue crews tried to save him. In life, Abraham Lincoln stood 6 feet, 5 inches tall. When a statue of the 16th president is completed in front of the new Washington County Judicial Center, Lincoln will be a total of 15 feet, 9 1/2 inches above ground, cast in bronze and placed atop a solid granite base. The statue itself will be 9 feet 6 inches, while the base will measure 6 feet, 3 1/2 inches. The Washington County 11-12 year-old Little League softball all-stars lost 5-2 to Marion County in the District 5 semi-final game on July 8 in Albany. Hannah Spalding and Samantha Mudd hit back-to-back doubles giving WC a 2-0 lead in the first inning, but that would be the extent of the damage. Marion County pitcher Madison Avritt settled down and allowed Washington County only one other hit throughout the game. Just call him “Rayface.” He is in charge of fun. “Rayface,” whose real name is Ray Dalrymple, the disaster service and service extension director for the Salvation Army, tells this to his “Paradise Valley” campers as soon as they meet him. Dalrymple, who has worked at the camp for almost 20 years, also tells the kids that he is Santa Claus’s cousin and even helps take care of the reindeer. The wedding of Anne Thomas Haydon, daughter of Angela and Thomas Haydon of Springfield, and Matthew Browell, son of Cynthia and Bruce Pierce of Nancy, Ky., will be held at 6:30 p.m. on Friday, July 25, 2008 at St. Dominic Catholic Church in Springfield. The reception will follow at Holy Trinity Parish Center in Fredericktown. All friends and relatives are invited to attend. Local school board member Pat Clements appeared for an arraignment in Washington County District Court Monday afternoon, facing charges of violating the county’s social host ordinance. The charges stem from a party held on Clements’ property June 7. Clements entered a not guilty plea, and a pre-trial hearing was set for Aug. 11. 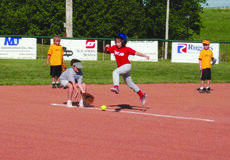 The 7-8 year-old coach pitch league officially came to an end with the intramural all-star game on July 10. The Red Hounds, a combined team from the Red Legs and the Rock Hounds, faced a mix from the Golden Girls and the Scrappers, aptly named the Golden Scrappers. The season ended with an exciting game that featured plenty of hits from both teams. The Red Hounds had several hits up the middle of the field, occasionally sending co-coach Tracy Graves scurrying out of the way. Kim Coleman and Jason Wright of Springfield announce the birth of their daughter on June 22, 2008 at Spring View Hospital in Lebanon. Mya Kamari Wright weighed 6 pounds, 9 ounces and was 19 inches in length. The WCHS football boosters club will hold a meeting at 7 p.m. on Thursday, July 17 at the football complex. With seven seniors and 18 juniors returning this year, the Washington County High School Commanders football team has a lot of youth. That's why they're working hard during the summer to prepare for this fall. WCHS opens the season on Aug. 29 at Lincoln County.